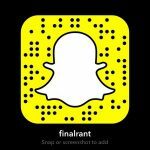 Final Rant is a personal blog written and edited by, Dana Emerson. Occasionally we utilize guest bloggers. This blog abides by word of mouth marketing standards. I believe in honesty of relationship, opinion and identity. This blog accepts forms of cash advertising, sponsorship, paid insertions, free products, or other forms of compensation. The compensation received will never influence the advertising content, topics or posts made in this blog, as all opinions are my own. That content, advertising space or post will be clearly identified as paid or sponsored content at the bottom of the post. I am not an expert or a medical professional, please bear that in mind when reading. I’m simply writing from my current view of opinion, thoughts and experiences. I cannot guarantee accuracy or completeness of any information on this site or found by following any link on this site. I am not liable for any errors or omissions in this information nor for the availability of this information. I am not liable for any losses, injuries, or damages from the display or use of this information. Remember, my blog simply represents my personal experiences and opinions. Feel free to use the share buttons located on this page to share posts on your social networks. Clear and proper credit must be given and any shared posts must link back to the original page. Excerpts and links may be used, provided that full and clear credit is given to Final Rant with appropriate and specific direction to the original content, with my permission. Unauthorized use and/or duplication of this material without expresses and written permission from me is prohibited. Unless otherwise stated, all photos are the work and creation of the brand, Final Rant and are licensed under a Creative Commons Attribution – NonCommercial-No Derivs 3.0 Unported License. Do not remove or crop out any placed watermarks or logos. Please contact me for permission to edit and use photos for any other purpose outside of the blog post in which they reside. Any downloadable files or images, including but not limited to pdfs, docs, jpegs, pngs, are provided at the user’s own risk. The owner will not be liable for any losses, injuries, or damages resulting from a corrupted or damaged file. Email addresses and names submitted in comment forms will not be sold, rented, or added to any mailing lists without your consent. We may at times use third-party advertising companies to serve ads when you visit our Web site. These companies may use aggregated information (not including your name, address, email address or telephone number) about your visits to this and other Web sites in order to provide advertisements about goods and services of interest to you. We do not sell, trade, or rent Users personal identification information to others. We may share generic aggregated demographic information not linked to any personal identification information regarding visitors and users with our business partners, contractors, trusted affiliates and advertisers for the purposes outlined above. Personal information will not be transferred unless we are legally obligated to do so. If you would like your information to be removed from our systems, please contact finalrant @ gmail.com. You can request to be removed at any time.